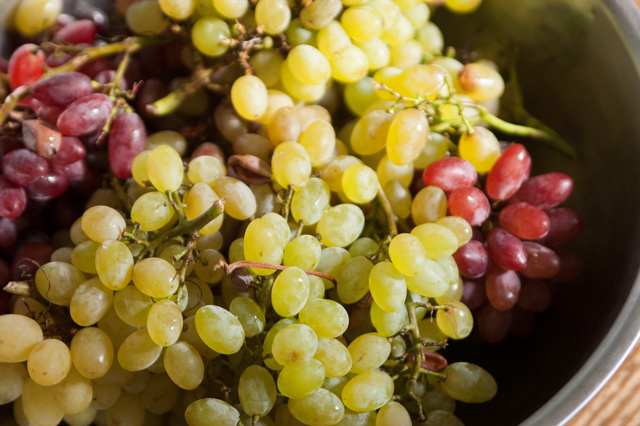 I totally get that apples and peaches grow on real trees, and berries come from real vines and bushes, but somehow it's hard for me to wrap my head around real grapes coming from real vines! Probably because I've rarely picked them myself. I didn't pick these either, but the Composer stopped by a fruit place and brought home huge quantities of these. Yum, I adore grapes but I must wait some months for them to be available here. I have a couple of seedless Concord grapevines that I planted several years ago. They produce so many grapes that my daughter and I make enough jam to last the year plus more to give away to give away to friends and family. Those inexpensive vines have more than paid for themselves many times over! Have you tried cotton candy grapes? Farrah, I've seen them at the store but not tried them. Cotton candy is not a flavor I run towards.